For those surfers that love what they do and are ready to do it at a higher level, the team’s professional lessons are the natural choice. Choose between a 90-minute and a 2.5-hour advanced instruction in the art of surfing delivered by accomplished teachers dedicated to maximizing your potential. These professional lessons are appropriate for all skill levels, particularly for intermediate and advanced surfers working to improve technique or those considering competitive participation. The pro surfers of Ohana Surf Project will create a personalized instruction plan designed to enhance your skills, keep you safe in the water, and maximize your enjoyment of the sport you love. 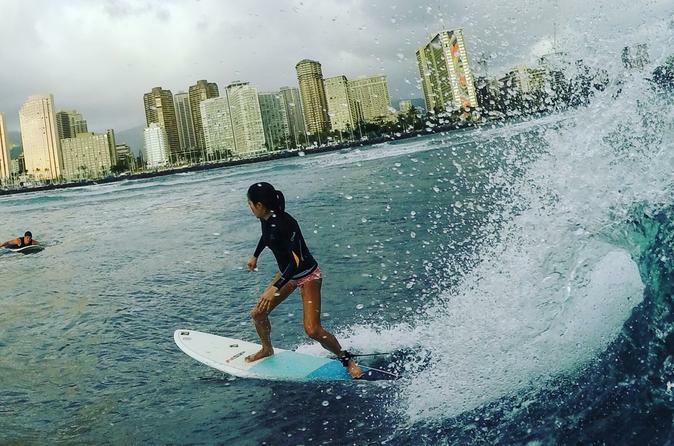 Start your private surf lesson with a morning or afternoon pickup from one of the convenient hotel locations. You’ll be stoked to ride in an air-conditioned and clean, easy-to-spot, orange-and-black surf school bus. After the friendly staff introduce themselves, you will be taken to the best surfing spot for the day based on your abilities and previous experience. Once by the ocean, you’ll prepare in the comfort of the mobile command center, a brand-new, luxury, custom Mercedes Benz Sprinter Van, watch a safety video, meet your instructor, and talk about surf conditions. Discuss what you hope to experience on the water and how the time together fits into your learning curve and hopes/vision for how you want your day to go. Have a pre-lesson briefing to talk about areas of improvement and goals. Finally, gear-up and head off to the beach. The expert surf instructors have over 75 years in aggregate as surf instructors. The coaches are not only good at surfing but love and have a passion for teaching. These guides have spent hundreds of hours learning the instruction methods so that you will can continue to learn every time you join, regardless of instructor or your skill level. They will help you learn the fundamentals or help you to level up some specific component of your surfing. Safety is a top concern and even on private lessons, as there are two instructors in the water, with one acting as a cameraman taking incredible shots of you up and riding. While safety is always our top priority, the team is also totally focused on helping you have an unforgettable experience, one that brings back the aloha within surfing. After the lesson, you will have another debriefing of the session with your coach and you can then retreat to the shade of our on-site tent to relax, hang with the instructors, or enjoy the perspective of watching the waves you have just been riding. When ready to go, you will be taken back to the mobile command center to check out photographs, videos, the work of your cameraman or buy some swag for yourself or friends. After your purchases are made, you will be driven back to your accommodations.